A couple of weekends ago I was at the training weekend for a new ministry within Josiah Venture. This autumn there are two football leagues starting. One is in Slovenia and the other is in Poland! To start the ministry off we had a training weekend for the men involved in the ministry. 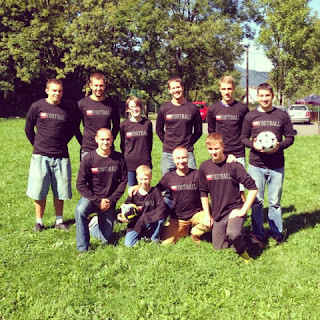 In the picture below there are two American JV missionaries (my boss is to the right of me and Chris, on the left of the front row, serves in Slovenia), the guy to the left of me is from Croatia and serving in Slovenia, and the rest of the guys are Polish. 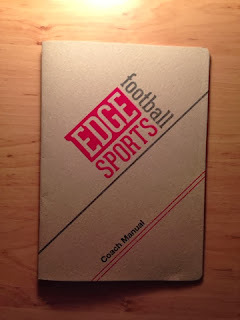 The idea of Edge is to reach young men through sports. The teams will meet every week to practice and will play each other within their leagues. The men in the photo will be their coaches. In the middle of every practice there will be a break to read the Bible and look at how it applies to their lives. At least half of the players on each team will be unbelievers. Each team will be linked to a local church and the hope is that through this ministry young men will hear about Jesus and start being discipled in those churches! It was such an honour to help at this training weekend and to meet these, mostly young, men who are passionate about Jesus and telling other men about Him. Please be praying for them as they recruit teams and get started! We made sure to take a photo of all those there that first weekend and I truly believe we'll look back at this photo as the start of something very exciting! Praying that God does big things for His glory through the obedience and boldness of these men.